Bead Bracelets are fun for all ages. Since beads comes in all shapes, sizes, and colors, you can customize it to best fit your age group and may even find beads to match your theme. This is a fun creative make and take that requires just a few items. Stretch Magic Clear Bead Cord There are various thickness to select from. Muffin Tin or small containers to hold beads. 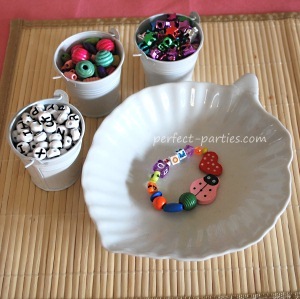 Sort beads into small containers or in muffin tins. Measure a length or cord. Cut a small piece of masking tape and fold over the string on one end. Beads won't fall off and you can write child's name on it. Tie in a double know when bracelet is made. Put glue on the knot to hold or it will slip. Hot glue gun will melt the cord so you need a low temp or for better hold Fabri Tac. This will require some drying time. Aleene's also has various glues that may work. Beads: Michaels, WalMart, Target, Amazon for bulk, eBay has a nice selection, just be sure to check sellers ratings and feedback. Sometimes you can find bead sets such as this Melissa & Doug Deluxe Wooden Stringing Beads with over 200 beads which comes with everything you need. My girls really enjoyed this set. Low temp glue gun and glue sticks are probably most inexpensive at WalMart but you can get them at any craft store.